Eat local -- and drink well, too! For a (belated) birthday dinner, my husband took me to one of our favorite Cincinnati restaurants: Local 127 downtown on Vine Street. Chef Steve Geddes was not in the house that night, alas -- he was cooking for a fundraiser at the Civic Garden Club. But the evening was still a culinary delight. I guess my favorite thing of all was the scrumptious sparkling-wine cocktail I had before the meal: a Seelbach, whose ingredients also include a little bourbon and some Cointreau. 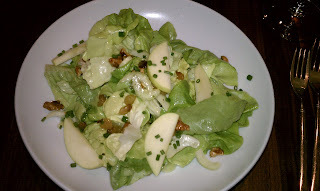 Dinner started with their irresistible (to me) Waldorf salad (in photo) -- I just love the toasted walnuts in this salad. My entree was sea scallops, and for dessert we split a panna cotta. One thing that's great about the cooking here is Chef Geddes's mastery of texture in food. Every dish, from appetizer to dessert, includes an element of crunchiness. That's such a simple touch, but brilliant. The next night we ate at Enoteca Emilia, the wine bar and small-plates restaurant in another Cincinnati neighborhood known as O'Bryonville. The food and drinks there are quite good, too, although we didn't linger as we were heading to a movie afterward. My friend and co-author (for Whole Living Journal) Mary Ann Barnes, MD, contributed this rustic but delicious treat, which is also a snap to put together. Mary Ann and I have been writing a column for the magazine -- called "The Healthy Foodie," big surprise! -- since 2005. Mary Ann also contributes to a website by that name; click here to read what she is up to. This recipe that uses in-season apples and just-about-out-of-season blueberries will make your house smell marvelous as it bakes. 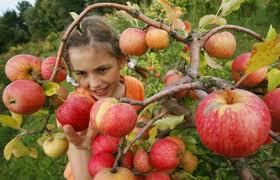 It's Apple Time -- Involve the Family! One of the compensations for the end of summer is the fall apple season. The new crop of crispy, sweet, healthy treats is ready for enjoyment. But there are lots of ways to appreciate and celebrate apples in addition to buying a bag at the supermarket or farm stand. How about a weekend drive into the countryside for apple picking? A Sunday afternoon powwow in the kitchen, making applesauce with the kids? Or whip up a batch of caramel apples to offer at your next party. A reader sent a link to this article, "10 Family-Friendly Apple Themed Ideas," which includes those I just mentioned along with several others. 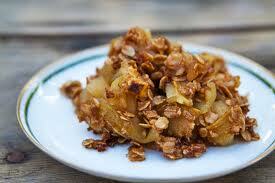 While we're at it, here's an easy recipe for one of my favorite apple treats. Lightly oil an 8x8-inch baking dish. In a large bowl, toss apples with flour, sugar, cinnamon and salt. Spoon apples evenly into prepared baking dish. In a smaller bowl, mix oats, sugar and walnuts, then stir in butter or margarine. Mixture should be crumbly. Sprinkle mixture evenly over apples and place in oven. Bake for 25-30 minutes, until topping has browned and apples are bubbly. Let cool to room temperature. Serve with frozen yogurt or ice cream, if desired. It's a grocery delivery service that started in Indianapolis, expanded to Cincinnati and then to other metro areas in the region, and has become a thriving business that delivers to 6,000 households weekly in Ohio, Indiana and Kentucky. But Green B.E.A.N. 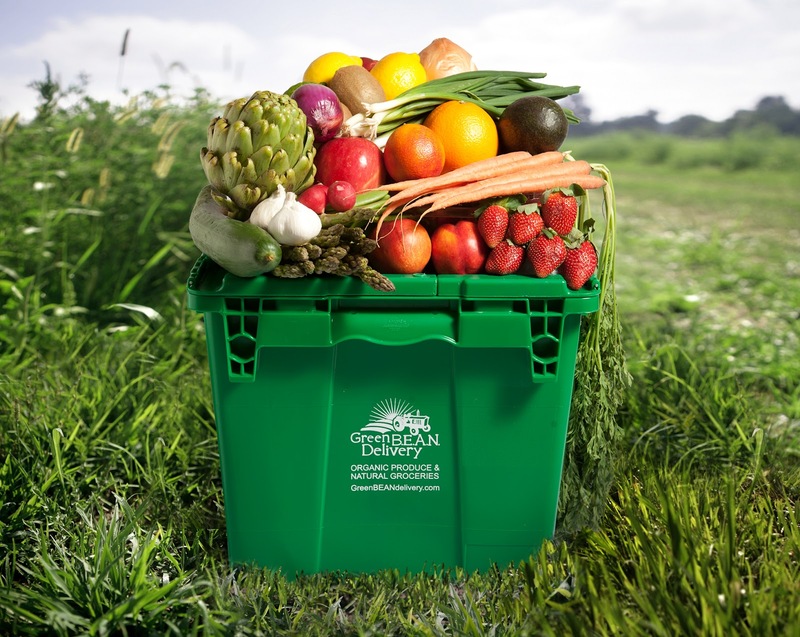 Delivery also is a major player in the movement to bring farmers, food producers and consumers closer together while helping to make organic, chemical-free and locally grown and processed more widely available. On top of all that, the company donates tons of food to soup kitchens and works with social service agencies to help fight hunger. It's quite a wide-reaching mission that began a few years ago as the brainchild of an Indiana couple, Beth Blessing and Matt Ewer. Blessing and Ewer founded the company in 2007 to support small and medium-size family farms and local food producers AND to give consumers access to healthy food year round, even outside the growing season when many of us can work farmers markets into our routines. Green BEAN (which stands for Biodynamic, Education, Agriculture and Nutrition) only took two years to expand from Indy to Cincinnati, thanks in large part to the founding couple's friendship with Cincinnatian John Freeland -- they all attended Indiana University together -- who is now Vice President of sales and marketing for the company and is based in Cincinnati. Other BEAN locations include Louisville and Columbus. So from the consumer's standpoint, how does it work? Customers go to the website (www.greendelivery.com) and select their location. Next, you set up an account and a delivery schedule -- weekly, bi-weekly or monthly -- for your groceries. There's no long term commitment or minimum length of time in the program, so you definitely can do a tryout and see how it works for you. There is however a minimum order of $35, but with no extra delivery or membership fees. And then you go to another page to select your stuff. While they do emphasize fresh fruits and vegetables they also offer a comprehensive list of packaged foods, dairy products, fish and seafood and more. Some but not all of the produce is organic, and preference is given to local and regional farmers and producers. I spoke with BEAN's John Freeland, who emphasized that what they do is "not a luxury service." 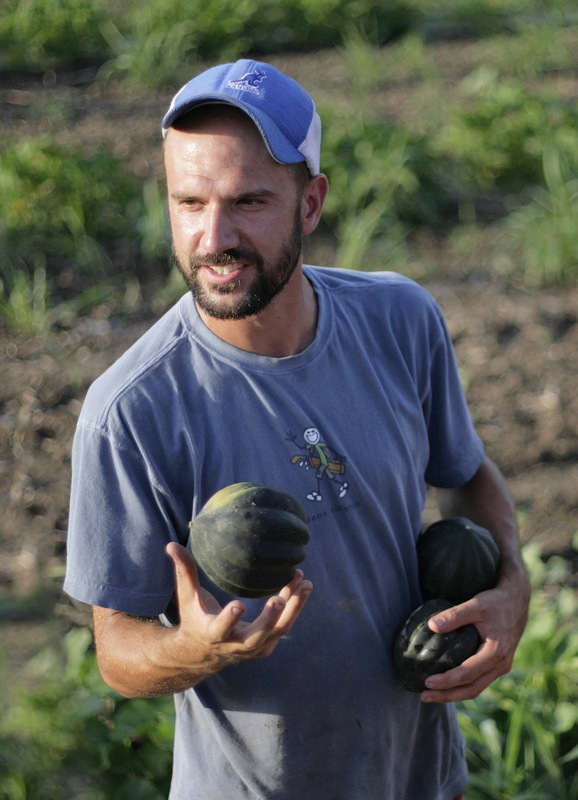 Their mantra is "convenience, affordability, and accessibility," he said, and their mission is to create "a network of farmers and artisans and take it directly to consumer's doorsteps." 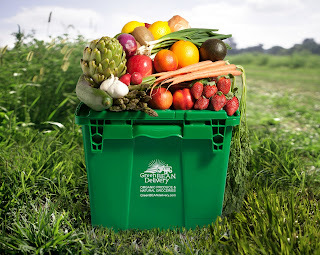 Your order comes in a green bin (as in the photo), kept cool by freezer packs. Cincinnati residents can also email info@greenbeanohio.com or call 513-761-BEAN (2326) for more information. Mac & Cheese is great comfort food, but healthy? According to a website sent to me by a reader, there actually are dozens of recipes for "healthy" macaroni and cheese. While it's a good that I usually have to skip, or only have the tiniest bit, if it had a better health profile I'd be chowing down on it a lot more frequently. Check out this article, "30 Blogs Serving Up Healthy Mac and Cheese." The list is divided into categories -- Dairy Free, Gluten Free, Low Fat, Organic and Low Carb. I'm most interested in the low fat and low carb versions, since fat and calories are the ingredients that I try to avoid. Preheat oven to 375. Prepare square (9 or 10 inch) baking pan with a light spray of oil. In a blender, combine cottage cheese, milk, mustard, cayenne, nutmeg, salt and pepper and puree until smooth. (I used my immersion blender.) 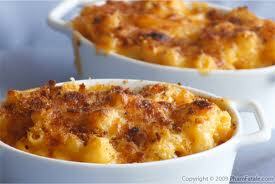 In a large bowl, combine pureed mixture with the onions, cheddar and uncooked macaroni. Stir well. Pour macaroni and cheese mixture into the baking pan. Combine the grated Pecoino or Parmesan and bread crumbs and sprinkle over top. Bake about 45 minutes, until topping is browned and the center is firm. 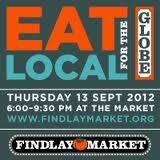 This Thursday, September 13, try to attend this year's top find-raiser for the Market. It's called "EAT LOCAL FOR THE GLOBE," and it happens from 6 - 9:30 PM. They've planned a two-tiered event this year. One (for $50 per person) is a casual, walk-around affair where patrons go from station to station around the market (outdoors, I'm told) to taste all kinds of foods from local farmers and the Findlay Market vendors. The latter include Bouchard's (known mostly for its fresh pasta and pasta sauces), Dojo Gelato, Fresh Table (gourmet-to-go prepared foods), Skirtz & Johnston (my own favorite bakery at the Market, and there are many rivals) and Pho Lang Tang (delicious Vietnamese cuisine), among others. Patrons also will enjoy live, access to the Biergarten, and sampling of craft cocktails made on-site and to order by the peerless Molly Wellman. For those who want to really live it up, the second tier is a Chef's Table for an eye-popping $175 per person. That blowout includes a seven-course meal prepared by many of Cincinnati's top chefs along with wine pairings for most if not all the courses. 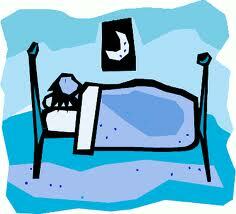 Insomnia and irregular sleep have plagued me much of my lifetime, although I've gotten better at it in recent years. Still, I can sometimes go several nights in a row without getting at least seven hours of sleep. If I don't get at least six, my brain definitely isn't up to snuff as the day and evening wears on. My last really bad sleep-deprivation period was last spring around the time that my mother died; she had a stroke from which the doctors said she could not recover, and lay in her deathbed for over two weeks before the end. Those weeks and for several thereafter caused me much anguish and made it hard to rest, drugs or no drugs. Even for lesser disturbances or anxieties, getting enough sleep can be a dicey thing. Therefore, I am pleased to share with you this informative list of "7 Ways to Get Better Sleep Without Drugs." Click here to read more details about this helpful advice. 1. Don't eat right before bedtime. Your body needs time to digest what you eat, and some foods (including alcoholic beverages) can interfere with your sleep cycle. 2. Read before bedtime. I almost can't get to sleep without reading before turning off the light, usually something easy like a magazine article. It's just so relaxing. 3. Get a better pillow -- and replace it often. You shouldn't use the same pillow for years on end! 4. Consider herbal remedies. This article suggests herbal teas, although I can't really recommend them right before bed because they make me have to get up in the night to pee. 5. Listen to music; just make sure it isn't disturbing anyone else around you (partner, neighbor or otherwise). And it should be a type of music that you find relaxing, not something that causes you to jump around your room practicing dance moves. 6. Visit an acupuncturist. Their remedies might work for you. 7. Try nose strips. They work for some people! 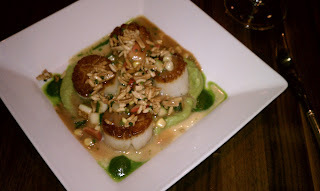 If you live in Cincinnati and haven't tried Enoteca Emilia in O'Bryonville, you need to do so. It's in a fun neighborhood along Madison Road (between Walnut Hills and Hyde Park) with several cute and unusual shops, antiques stores and the yummy baked goods and charming atmosphere of Bonbonerie Cafe & Bakery. Across the street from Bonbonerie, Art of Entertaining holds wine tastings, cooking demonstrations and other food/spirits oriented events while also running a catering service where the long-gone-but-not-forgotten Chateau Pomije used to delight city dwelling wine-lovers. But full service restaurants in O'Bryonville? Not so much. That is, until Enoteca opened about a year ago, taking over a space that several other restaurants of various styles had tried to turn into a successful operation. Now, someone finally has gotten it right. They specialize in small plates, pastas and pizzas, and everything on the menu feels authentically Italian. That's not at all common in Cincinnati, which has a dearth of interesting Italian restaurants, excepting the high end Nicola's and its more casual Fountain Square cousin, Via Vite. 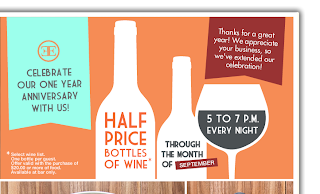 To celebrate the restaurant's first anniversary, they're chopping prices in half on all bottles of wine on their somewhat short but varied list of Italian whites and reds. 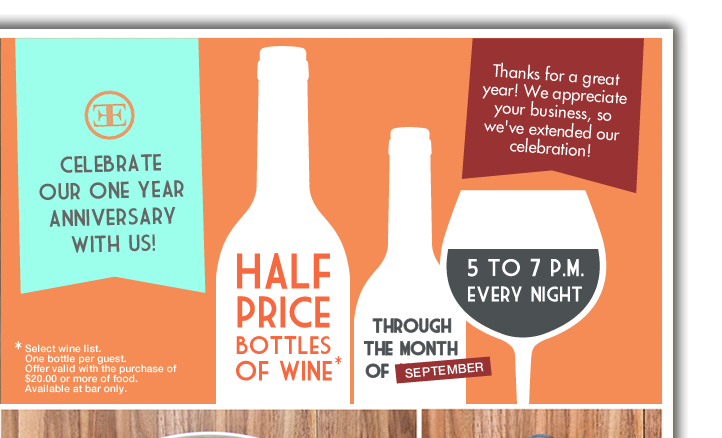 That deal only works between 5 and 7 PM, but it lasts for the entire month of September. Great reason to get on by! Check out their current menu here. 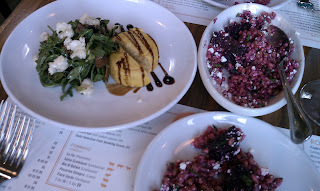 The photo from our recent dinner shows two starters -- shiitake and baby arugula salad with a butternut squash custardy cake, and farro salad with beets (listed on the menu under sides). We also shared a plate of Spaghetti Nero and a side of grilled Italian bread. My husband probably could have used a bit more food but that was enough for me. I've also liked the cocktails served by the talented bartenders, although this time I just stuck with a quartino (about a glass and a half in a small carafe) of red wine. By the way, Enoteca Emilia bills itself as an "Italian Wine Bar with Handcrafted Menu by Chef Jeremy Luers. The whole staff is super friendly and welcoming.